Those anxiously awaiting the feature adaptation of Kami Garcia and Margaret Stohl's Beautiful Creatures still have until February to wait to see Aiden Ehrenreich and Alice Englert take on the roles of star-crossed lovers Ethan and Lena. On the bright side, a trailer for the film has made its way online and gives us a look at the teen couple's budding romance and the drama surrounding it. Directed by Richard LaGravenese, Beautiful Creatures stars Aiden Ehrenreich as Ethan, a teen living in a small town in the south who finds himself interested in the mysterious new girl Lena. The two soon form a strong connection, and it's revealed that their families share a history that's tied to the town. The trailer, which comes courtesy of iTunes, begins at the gates of Ravenwood Manor, which also happens to be featured on the poster (below). Seems Beautiful Creatures has borrowed a page from Game of Thrones' book in using Florence + the Machine's "Seven Devils" The tune was used for the HBO series' Season 2 trailer and given the dark tone of Beautiful Creatures, it seems like a fitting song for this book-to-screen adaptation as well. The trailer gives us a look at a few familiar scenes, including the classroom windows shattering, and Emmy Rossum's Ridley causing trouble at dinner. We also see Lena as the unwelcome new girl, who catches Ethan's eye. And we get a look at Jeremy Irons as Lena's Uncle Macon standing on the porch, giving off his Boo Radley vibe. And then of course, there's a few kissing moments between Lena and Ethan. Fans of the book, correct me if I'm wrong, but is the number-tattoo on Lena's hand an add-in? Or is that something I'm not remembering from the book? Either way, it's a cool little countdown effect. And here's the poster, which shows the creepy but beautiful gates of Ravenwood Manor. Great use of the words "dark" and "light" at the bottom there! 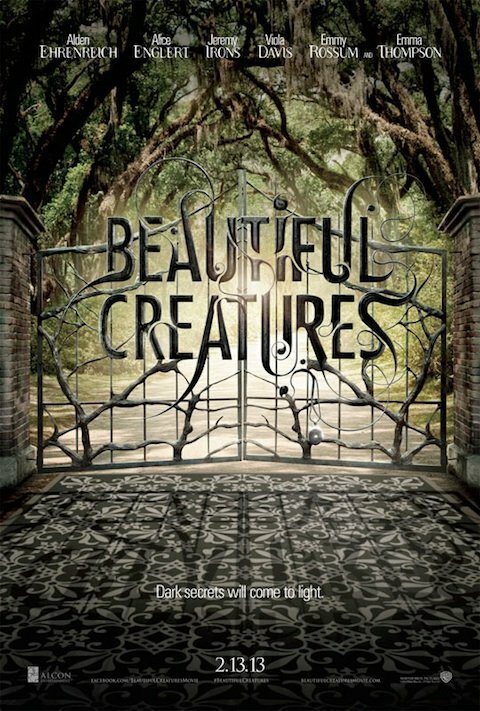 Beautiful Creatures arrives in theaters February 13, 2013.